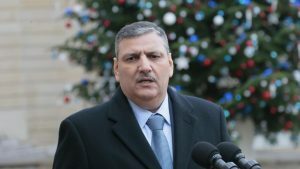 The war against President Bashar al-Assad lingering on for more than six years would continue as the UN mediation has failed, Syrian opposition figure, Riyad Hijab, chairman of the Saudi-backed High Negotiations Committee (HNC) said Thursday. Hijab made the comments following remarks by UN mediator in the Syrian crisis, De Mistura, who had, a day earlier, called on the Syrian opposition to be “unified and realistic” in accepting it had not won the war. De Mistura stopped short of saying Assad won the conflict, which has devastated the country for more than six years now. Syrians in 2011 stood against the Bashar al-Assad regime but the uprising was met with clampdown. A bloody war has ensued involving the Islamic State group (IS) and other terrorist groups. Around 400,000 people have died in the conflict. The UN mediator indicated that the conflict was almost over because many countries were involved principally to defeat IS and a national ceasefire should follow. Assad, supported by Russia, Iran and Lebanon-based Hezbollah, has pushed back the opposition fighters to the corner. The rebels now control only the majority of the country’s northwest, enclaves in the southwest, in Homs province and near Damascus. Several UN roundtables to end the conflict have hit roadblocks over many disagreements including the role of Assad in a transition. Written by: KanelkaTagba on September 8, 2017. Posted by KanelkaTagba on Sep 8 2017. Filed under World News. You can follow any responses to this entry through the RSS 2.0. Both comments and pings are currently closed.